You want the best chance of crossing the line first. This means you need instant access to accurate data, and displays that are absolutely reliable. Raymarine Wireless instruments excel on all fronts. They display all the data you'll ever need and have user-configurable pages, crucial for racing performance with no wires through your hull or down your mast. Page hiding. Customize the display to show only the data options required, minimizing the time it takes to select the information you want. Maximized performance. The displays have an innovative Start Line feature, Line Bias, Wind Shift and Timer functions together with indicators for acceleration and speed trend. Excellent visibility by night. The black background ensures minimal night vision disturbance and a choice of red or amber digits allows you to select different colors for different data. 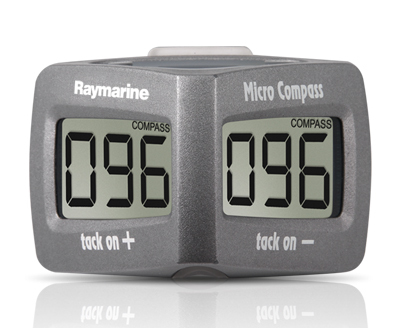 The ultimate tactical race compass and wind shift indicator. Its two-tier display shows your heading, how far you're above or below the mean course, and how much you're being headed or lifted. It will enable you to quickly and easily establish the favored end of the start line, and will help you sail the shortest distance to the windward mark. Its two-tier display shows your heading, how far you are above or below the mean course, and how much you are being headed or lifted. It will enable you to establish quickly and easily which is the favored end of the start line, and will help you sail the shortest distance to the windward mark. Downwind, you can see how far off dead downwind you are, and when you should gybe for optimal VMG. 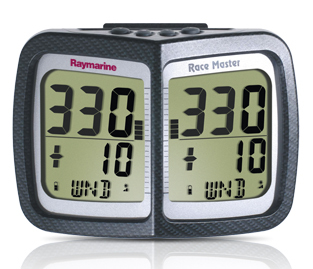 Data Displayed: Compass Heading, Wind Shift Indicator, Line Bias, Race Timer. 100% Solar powered. It also comes with a Micronet Hull Transmitter to provide boat speed and depth data. The System can then be further extended to allow the addition of Wind and GPS information as well as compatibility with the complete range of Micronet Displays.